Farmhouse Printables coffee mugs with chicken quotes are sure to brighten any morning. You all know I love my coffee, but did you know that it is almost equally important that I drink it from a sturdy, well balanced mug? Yes, folks, not only am I a coffee snob but I am also picky about my mug! The ultimate coffee experience is a combination of both. I recently got my hands on a new mug from Farmhouse Printables and I am here to tell you that this is a quality mug! But, the goodness goes even farther, because it has a quote about chickens AND coffee on it. Well, you know this mug was made for me. I bought one for me and a few for gifts. (Each mug is 11 oz large, dishwasher, microwave and oven safe, glossy white ceramic). 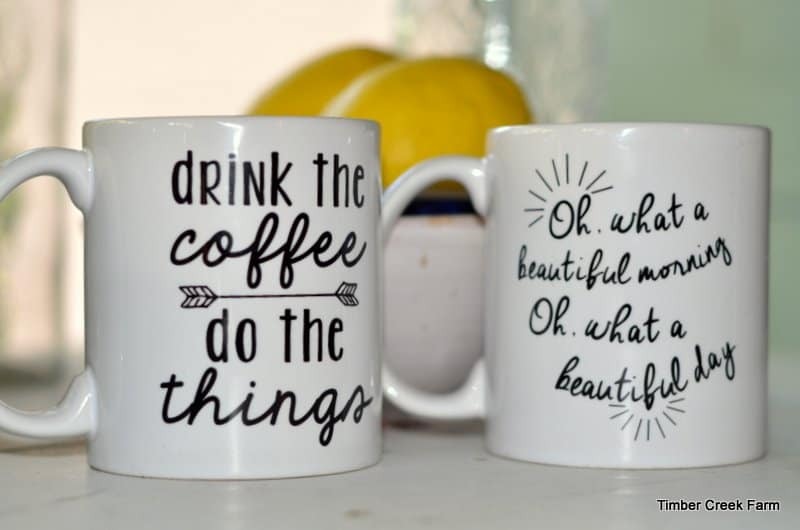 Talking over the details of the mugs with Jessica, owner of Farmhouse Printables, led her to offer the mug as a giveaway prize to one of my lucky readers. Perfect way to start off my fall giveaways! I am recommending that you take a look at all the designs in Farmhouse Printables Etsy shop. If you are the winner, you can choose the coffee mug design that is best for you. 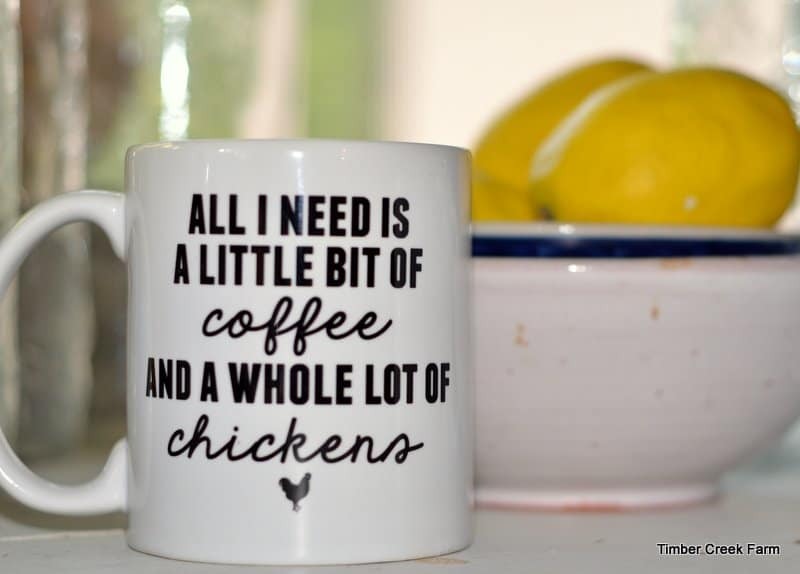 I, of course, just had to highlight the chickens and coffee one, because, well they are things close to my heart. Here are two other designs I purchased for gifts. I am sure that once you enter the Etsy shop for Farmhouse Printables, you will also begin to shop for yourself and people on your gift list. Birthdays, Christmas, and just because gifts are all there. And don’t forget to get something meaningful for yourself, too. I love the fun and thoughtful quotes on the merchandise. Take a look at the digital prints available too, and there are new pillows and pillow covers! It’s So much fun to shop here. Can you imagine giving a baby gift from Farmhouse Printable? Those prints are perfect for a nursery. Maybe add in a throw pillow with a fun quote for the future nursing mother. The farmer and homesteaders in your life will appreciate the farm themed quotes. If you have a quote you need, I know Jessica will be happy to work with you on a custom order. To enter the drawing to win a free mug from Farmhouse Printables, follow the links in the Rafflecopter widget below. The contest runs from Tuesday October 20 through Monday, October 26 (midnight) . I have such a chicken fetish, even though I can’t own them where I live. It’s an ongoing joke at work that, someday, I’ll be the ‘crazy chicken lady’. I need the mug to put on my desk and drink my coffee from every morning! Someday I shall make there statements come true! Thanks for this fun opportunity, Janet! perfect for a lot of us! I agree! I hear the younger people saying this and I want to be cool too! I bought this one for a gift. Haha I like drink coffee do the things too, but also think some of the bible verses would make good gifts. oh these are just so stinkin cute!! I love the one with the chickens, of course!! I hope you entered Nicole! The quotes are great! Who wouldn’t love drinking coffee from them? Drink the coffee, do the things is my FAVE! Oh…I want 2 mugs. 1. There’s no way you woke up like that. And 2. Super mom…super tired. I love the chicken one! Every chicken lover needs one! Love anything to do with coffee and chickens! Love he chickens/coffee mug! Chickens are a balm to my soul. The chicken mug pretty much sums up my life. The chicken mug is a must for me! I adore the chicken mug and this blog is pretty spiffy as well! Well thank you kindly for the compliment! I’m all about coffee and chickens *v*? Love coffee and chickens *v*?Thanks for the opportunity! Those are really cute. How much coffee would you say they hold? I love my big mugs that hold 10-12 oz.